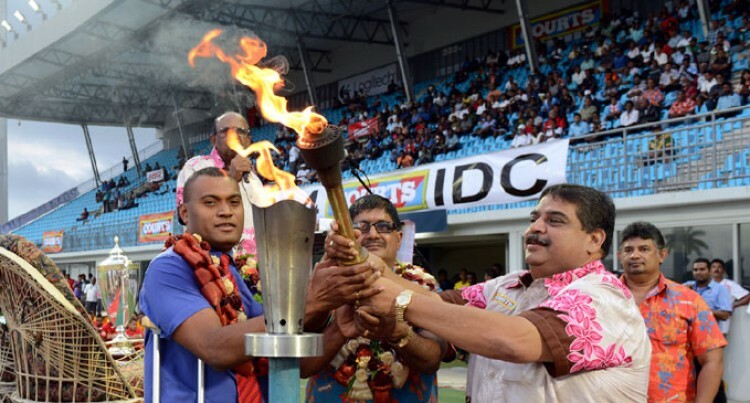 The 76th Courts-Inter District Championship was officially opened by the Assistant Minister of Youth and Sports Iliesa Delana at the ANZ Stadium yesterday. Delana says Government is committed to promoting sports and the development of youths in the country. “We will continue to play our part in the promotion of sporting opportunities, provision of relevant equipment, playing fields and technical experts,”he said. Delana said the Ministry of Youth and Sports is supportive towards Fiji Football development plans. “My ministry is very supportive of Fiji Football Association’s major development plans as it will boost the development of the sport in Fiji. “Any of Fiji FA project or plans will augur well with Government’s effort to harness the power of sports as a major vehicle for youth development in Fiji. “We continue to recognize the contribution of sports to Fiji’s economy, national unity and social inclusiveness. Fiji FA president Rajesh Patel acknowledges the presence of Delana and reminded the teams to be good sportsmen. “The eight districts are battling for the biggest silverware which was bought from the United States for $10,000,” Patel said. “And we’ve adopt 90 minutes of football and that’s why playing over two weekends was a best option.